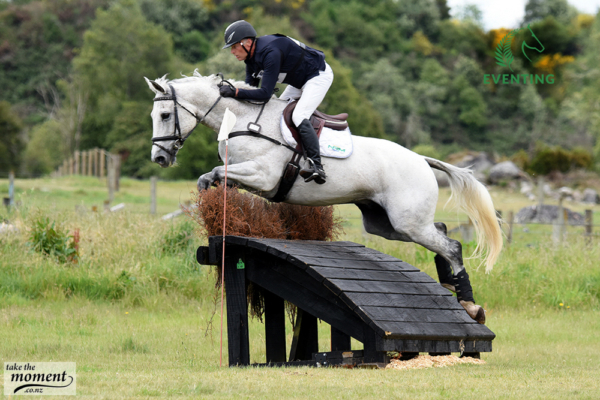 Conditions were ideal for eventing at the North Island National Equestrian Centre in Taupo over the weekend, with neither rain nor wind to mar the good going, and riders able to benefit from the excellent cross-courses produced by the team of designers at all levels. The Dynavyte CIC3*class was won by former international Matthew Grayling riding Winky Foley’s relatively inexperienced NRM Trudeau. They held the overnight lead after Saturday’s dressage and showjumping, earning 32.5 dressage penalties and jumping clear but with a time penalty, and jumping clear across country with 4.4 time penalties on Sunday for a final score of 37.9 penalties. Cambridge solicitor Nick Brooks was second on For Fame, pulling up from seventh place overnight after producing the fastest cross-country time with 0.8 of a time penalty. They incurred 37.6 dressage penalties and had a rail down in the showjumping, plus 4 time penalties, for a final score of 46.4 penalties. Former NZ Young Rider team member Abigail Long riding the experienced Enzo at elite level now, was thrilled to finish third, having produced one of only three clean showjumping rounds, and adding 12.8 cross-country time penalties to their fifth placed dressage score of 36.1 to finish with 48.9 penalties. Madison Crowe was fourth on Waitangi Pinterest, Abbey Thompson fifth on Rockin It, and Samantha Felton sixth on Ricker Ridge Rui, but this was good enough for the winners at Takapau two weeks ago to claim the Dynavyte prize pack for the most points accrued from the Super League classes at both events. After lying second overnight, Diane Gilder glanced off a brush corner near the end of the course with Your Attorney, blaming herself, saying, “I was just so happy with him I went to sleep and didn’t tell him it was a skinny corner,” so she is kicking herself, but the riders agreed it was a good early season course. Abigail Long (Levin), Enzo, 28 pts.